Privileged accounts represent the largest security vulnerability an organization faces today. In the hands of an external attacker or malicious insider, privileged accounts allow attackers to take full control of an organization’s IT infrastructure, disable security controls, steal confidential information, commit financial fraud and disrupt operations. Stolen, abused or misused privileged credentials are used in nearly all breaches. With this growing threat, organizations need controls put in place to proactively protect against, detect and respond to in-progress cyber attacks before they strike vital systems and compromise sensitive data. 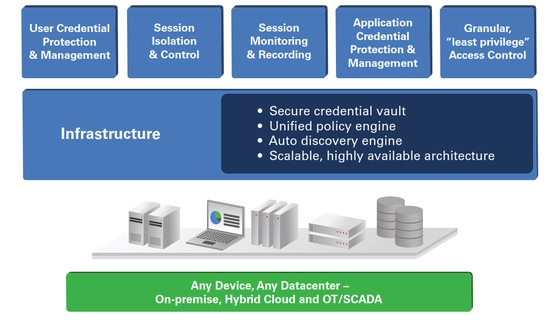 Designed from the ground up for privileged account security, CyberArk has combined a powerful underlying infrastructure with our core products to provide the most comprehensive solution for on-premise, hybrid cloud and OT/SCADA environments. At the core of the infrastructure are an isolated vault server, a unified policy engine, a discovery engine and layers of security that provide scalability, reliability and unmatched security for privileged accounts. Long-term cooperation with CyberArk and a broad customer base. Successfully implemented projects with CyberArk in various sectors. InfoGuard has a competent team for Privileged Account and Identity Management. Why privileged accounts are at risk - and how to get this under control!